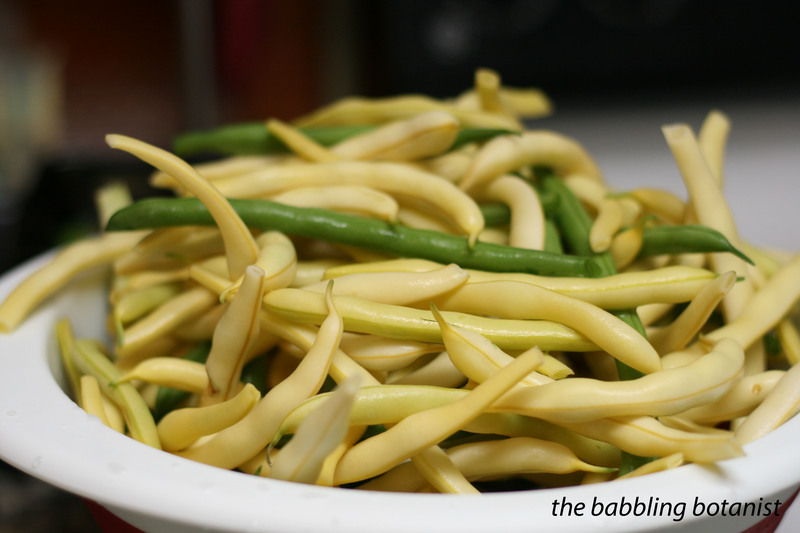 The beans are coming in hot, so I was perusing my PNW 355 publication on pickling to check out their recipe for dilly beans. I was kind of surprised to see “fresh dill or basil sprigs” in the ingredients. Dilly beans made with basil?! Well consider me intrigued. So I went out and picked some basil from the garden to test this out. In some jars I put basil, in some I put dill, and in some I put both. We’re living on the edge here people! I’ll let ya know how the basil taste in a couple weeks, the dill I know is good! 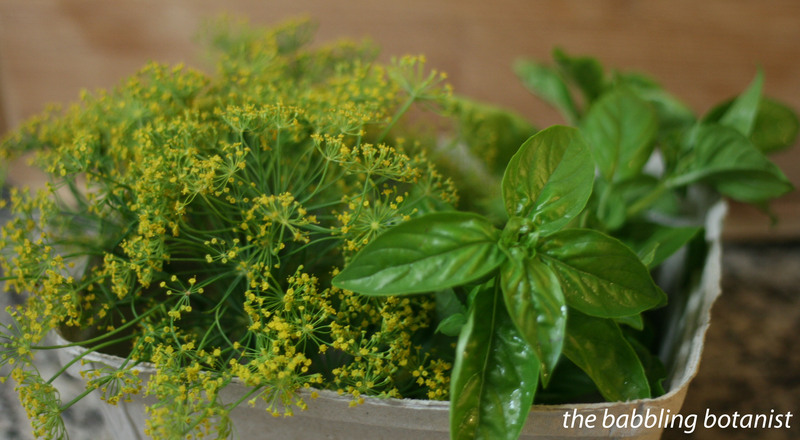 Beautiful fresh dill and basil. One thing that I love about this recipe is that it is a raw pack. For the recipe in Ball, you make the brine, and then you toss the beans into the brine for a bit and hot pack the jars. This is fine if you want to do it that way, but I find it really hard to pack my jars nicely with a hot pack. And I don’t see a need to soften beans either. Anyway, place some basil and/or dill in each jar, along with the garlic. What I typically do is hold a jar sized bean in my hand (you need a half inch head space) and snap my beans to match the reference one. Then I pack the nice perfect ones into jars (the bottom ones below) and the “nubbin bits” go into another jar. The nubbin ones are good for snacking on or for salads, but the whole ones are nice to have also for drinks and things, so it works great to make both. Once all your jars are packed, make the brine by combining the water, vinegar and salt in a saucepan and bringing it to a boil. I like to make it after I fill the jars so I can see how many jars I have and make more brine if I need to. 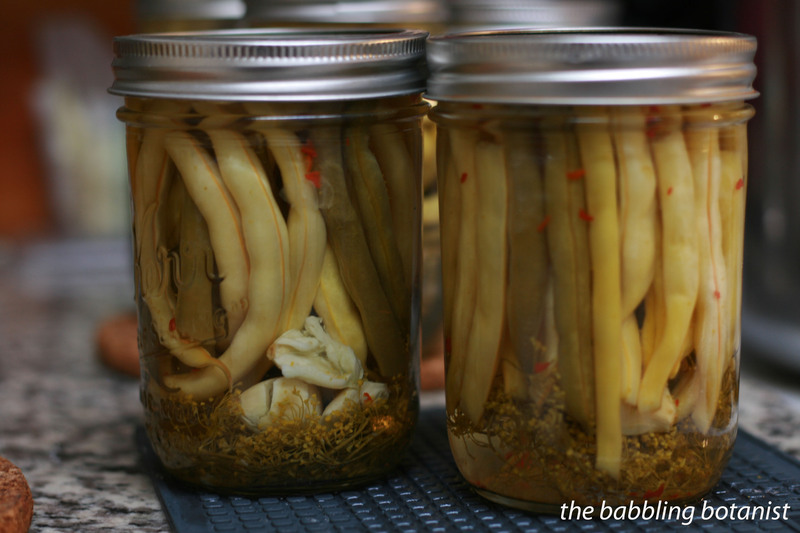 If you want a spicy bean, you can add the red pepper flakes to the brine, or you can just add the flakes to the jar. I added them to the jar in this case because I wanted to make some of them hotter than others to decide what I like best, because last time I made these I wanted them hotter. 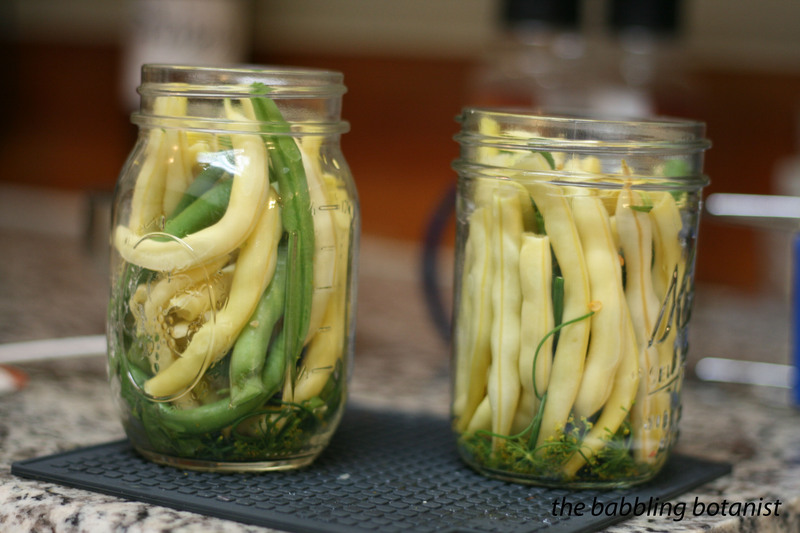 Fill your jars with brine, use a plastic or wooden utensil to remove any trapped air bubbles from between the beans, adjust brine to a half inch head space, wipe the rims and apply the lids and bands. Tighten finger tip tight and place the jars in the canner. Process in a boiling water bath canner, covered by at least 1-2 inches of water for 10 minutes. The publication actually lists 5, but I have never seen that before except for jams and jellies, and your stuff should all be sanitized if you do that short of a time, so I did 10 minutes just to be safe. After 10 minutes is up, turn off the heat, remove the canner lid, wait 5 minutes and remove the jars to a hot pad or towel. Cool 12-24 hours, remove bands, wipe, label and store. 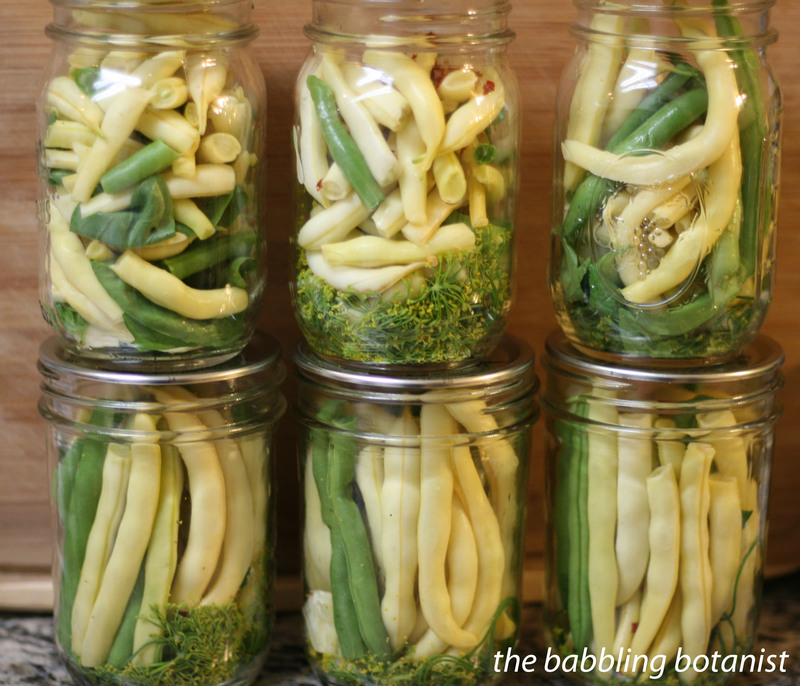 Let them pickle for a little while before digging in! ← Can it forward day. A giveaway! Wow. I have so many beans and basil in my garden (and I had dill, but most of them are now drying because they went to seed- but seeds would work right?). I’m going to try this soon!! Seeds still work, yep. Enjoy!